This scorpion was found amongst the crushed rock of a flower bed adjacent to a watered lawn in Glendale, Arizona, April 2008. The actual size is about 3 cm. The propensity of this arachnid to climb vertical surfaces is one reason it is the most common scorpion species found in homes across the Desert Southwest - from southeastern California and s. Nevada to western New Mexico. In Arizona it is particularly abundant in orange groves which over the past few decades have almost completely been converted to residential housing - retaining the populations of scorpions. Common in Phoenix, Tempe, Mesa and Tucson, Arizona. Around homes they prey on insects attracted to outdoor security lighting. They also prey on termites (which homeowners should appreciate). Homes with watered lawns and at least one pet dog seem especially favorable to these predators. Probably the most severe medical consequence of getting stung is the resulting anxiety. For most healthy individuals the sting will result in pain and discomfort lasting a few hours. If young children or persons in poor health are stung medical attention and the available antivenom may be warranted. The toxin is a small protein that interferes with sodium channels in the synapses of the nervous system (Jacques, Y. et al. 1980. European J. of Biochemistry v. 111, p. 265-273). This is the only medically important species in Arizona and according to the U. of Arizona Coop Extension, in the past 20 years there have been no reported fatalities in the US due to scorpion stings. 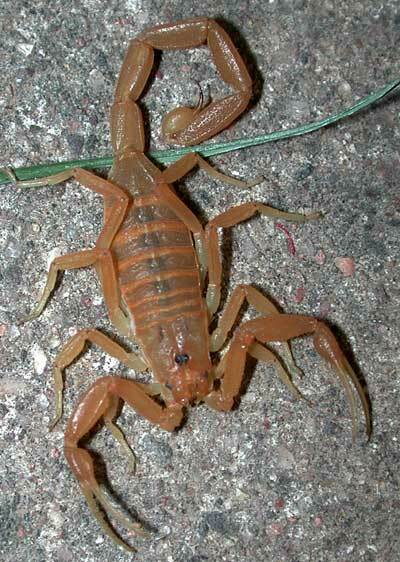 There are dozens of scorpion species in Arizona. 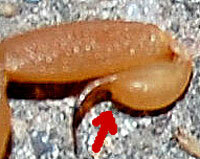 If you want to be sure yours is indeed this mildly dangerous species, check the telson (bulb structure) just ahead of the stinger on the tail. You should see a slight tooth with close magnification.